A company of coach builders for specialist and up-market automobile manufacturers, of Hendon and Kingsbury. 1870 The company originated in Belgium as Carrosserie Vanden Plas. 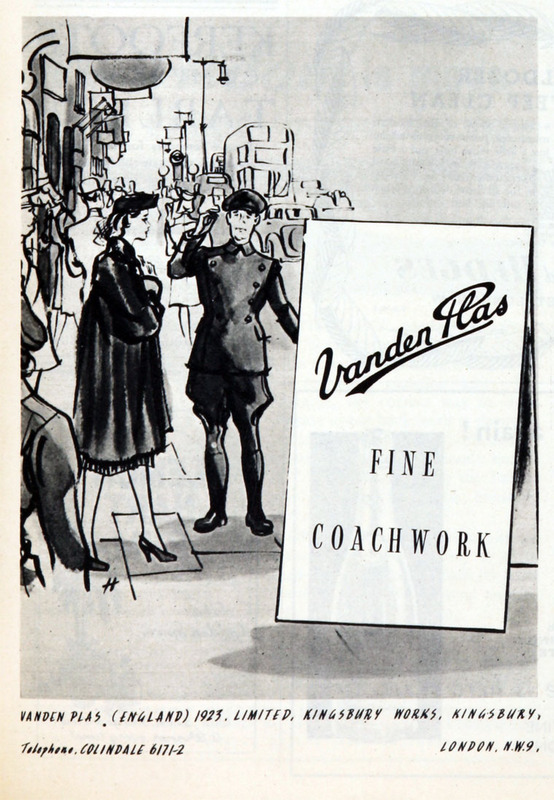 1906 The company first appeared in the United Kingdom when Métallurgique cars were imported with Vanden Plas coachwork. c 1910 A British motor company Warwick Wright (now Peugeot dealers) purchased the United Kingdom rights to the Vanden Plas name and established Vanden Plas (England) Ltd.
WWI The company became involved in aircraft production and was bought by the Aircraft Manufacturing Co (Airco) based at Hendon, London. 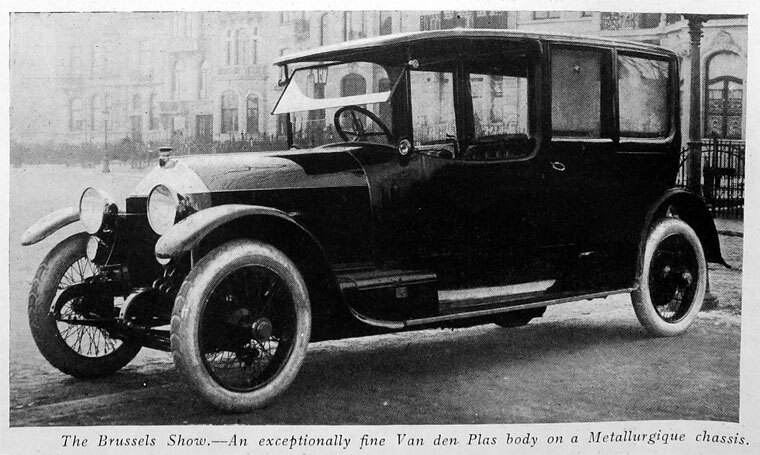 1917 A new company, Vanden Plas (1917) Ltd., was formed. The company seems to have struggled to get back into coach-building. 1922 The company went into receivership. The exclusive UK rights purchase seems also to have gone as in the early 1920s the Belgian firm was exhibiting at the London Motor Show alongside the British company. 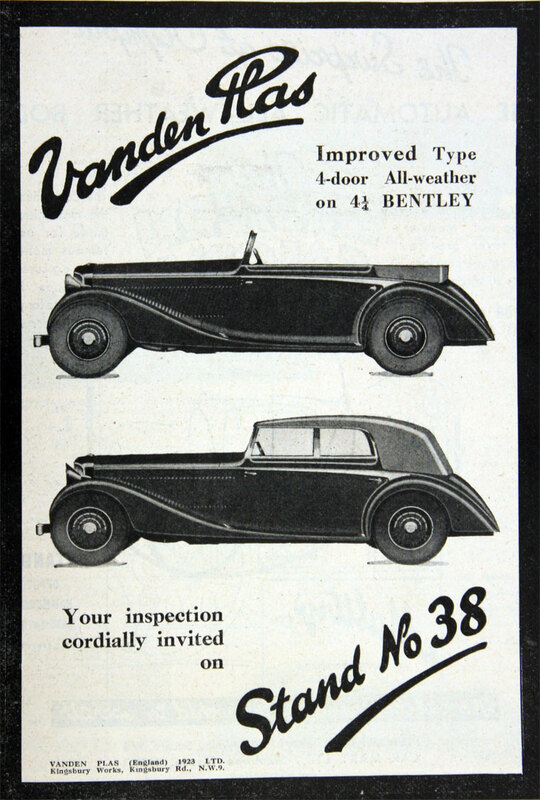 1923 Formed as Vanden Plas (England) 1923 Ltd. The rights to the name and the goodwill were purchased by the Fox brothers who moved the company from Hendon to the factory of Kingsbury Engineering, and built on the contacts with Bentley that had been made. The new firm built up a reputation for high-quality motor-car bodies and gradually extended its site, purchasing Kingsbury House in 1926. 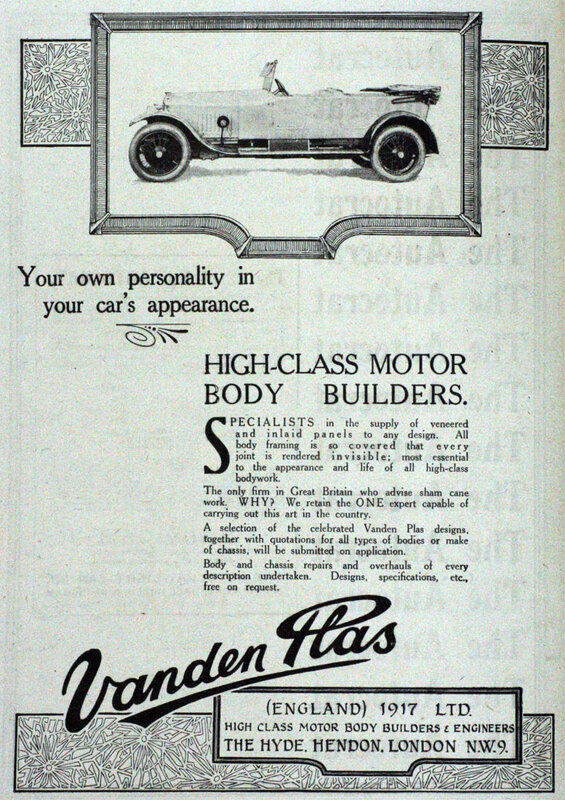 Between 1924 and 1931, when Bentley failed, Vanden Plas built the bodies for over 700 of their chassis. 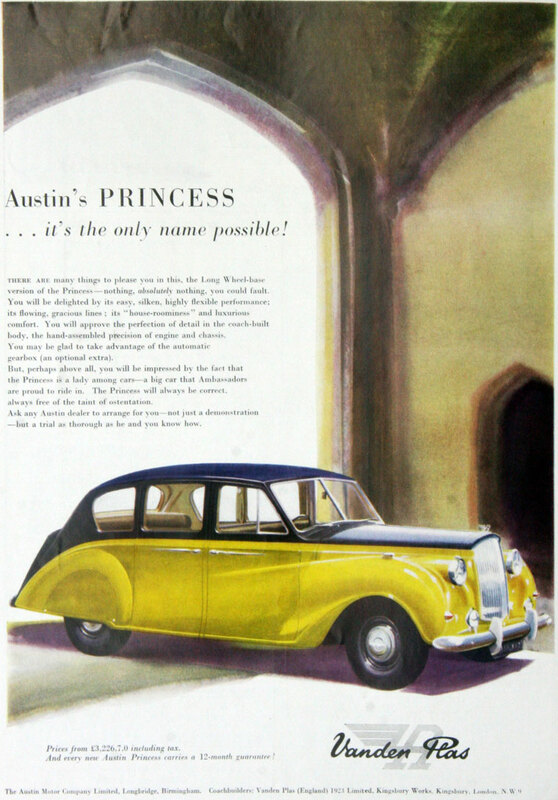 1930s the company became less dependent on one car maker and supplied coachwork to such as Alvis, Armstrong Siddeley Motors, Bentley, Daimler, Lagonda and Rolls-Royce. The company also updated its production methods and took to making small batches of similar bodies. 1939 With the outbreak of war the company went back into aircraft work and coach-building stopped. WWII Manufactured parts for the De Havilland Mosquito at Kingsbury. 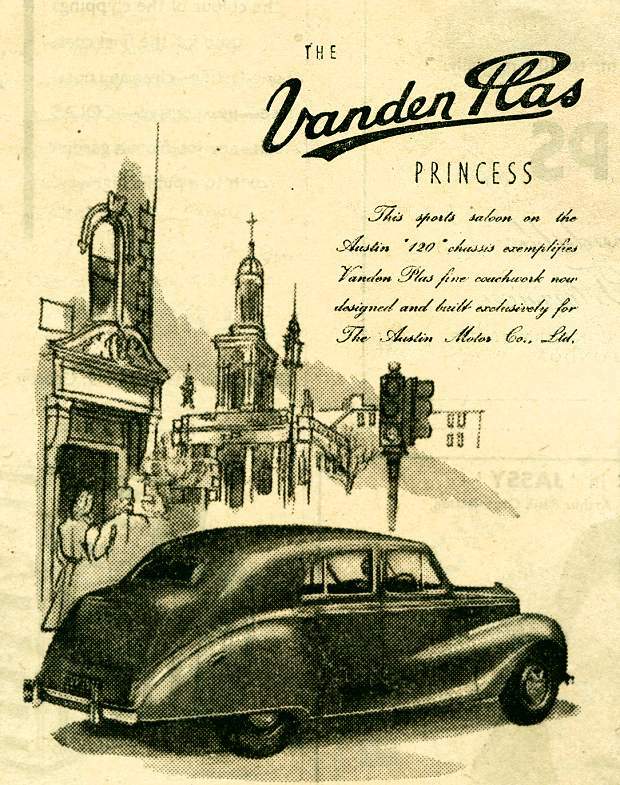 1945 The company looked to restart its old business, but a surprising new customer came along - Austin wanted to produce a luxury car and approached Vanden Plas. 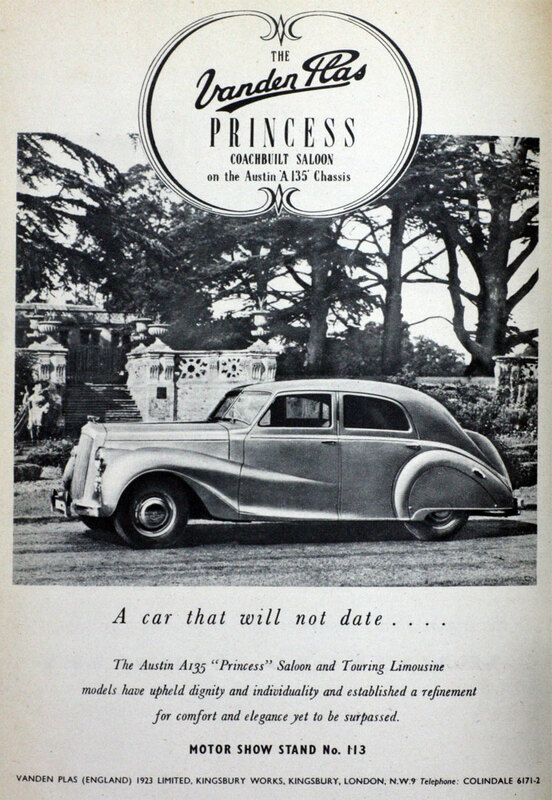 Post-WWII: Final design as an independent of the Princess on an Austin chassis. 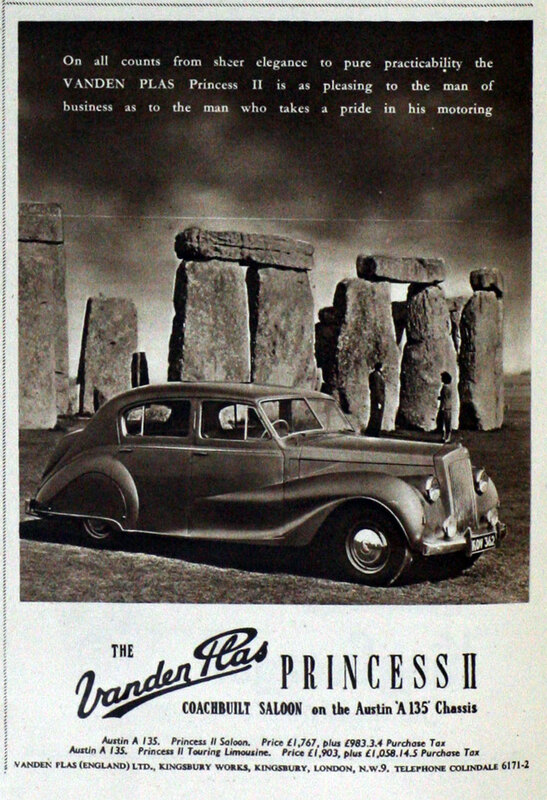 1946 Vanden Plas became a subsidiary of the Austin Motor Company and produced its A135 Princess model. 1966 Jaguar merged with the British Motor Corporation in 1966 to form British Motor Holdings (BMH). 1968 BMH in turn merged with the Leyland Motor Corporation to form the British Leyland Motor Corporation. The Vanden Plas name continued to be used by Jaguar on its Daimler variants, and American cars. The name ultimately ended up with the Rover Group, and Jaguar was forced to stop using it in the United Kingdom, though it continued to do so in America. The Daimler Double-Six Vanden Plas became, simply, the Daimler Double Six, and the Sovereign designation was transferred to Jaguar. Jaguar was subsequently acquired by Ford. The North American rights to the name were also sold on and also now reside with Ford. 1968 Production of the Vanden Plas Princess limousine stopped in 1968 when Jaguar introduced the Daimler DS420 Limousine. (Jaguar had acquired Daimler in 1960) The DS420 was produced at the Kingsbury Lane Vanden Plas factory in its early years. Placed on Jaguar models, the Vanden Plas label still signifies Jaguar's most luxurious variant. In addition, Jaguar uses the Vanden Plas name in markets where, for licensing reasons connected with Daimler-Chrysler, the Daimler name cannot be used. These include the United States and some Middle East countries. This page was last edited on 24 December 2016, at 06:52.